This is our new entry hall. This is where we greet our guests and put on our shoes. And take them off. This is what it looked like when we moved in. In 2011, we added the wall on the right. Then, we built the bench which is made of a couple IKEA cabinets on a DIY toe-kick with an upholstered foam mattress on top. And last year, I showed you our first entry way reveal. It was very colorful and I made it for a contest. I placed second in that contest and the money price was dependent on signing a very long contract. One of the stipulations involved how the "after" image could be shared. And not be shared. So a while back, I decided to re-do the entry. This time just for ourselves. Not too long after, I was contacted to partner up with WallpaperDirect.com and I immediately thought this wall would be the perfect wall for some wallpaper. I picked this beautiful high leafl vinyl, paintable wallpaper for the space. Then I prepped the wall, we put up lining paper, and we put up wallpaper. I had a new cover made for the bench cushion. The fabric I used is Sunrise black linen blend fabric from Fabrics.com. I spray painted the Madras storage baskets from Work Market gold and sewed some pillows. I got the faux lleather fabric at a local home fabric store for 10 bucks. The swan fabric, I picked up last time I went to Denmark. I bought the hat at El Capitan, when we went cabin camping in the spring. I bought two deer hooks a while back at Urban Outfitters (discontinued). Then, I needed one more for this make-over and found one more deer hook on Amazon.com. I made a wreath for one of the hooks. Because you know I love a wreath on a hook, right? I made some flamingo artwork for over the cabinet, which (after a false start) I had printed at Pixel2Canvas.com. The quality is incredible. I will share more about how I made the print and set it up for printing in an upcoming post. I got a pink Sanela cushion cover at IKEA. And you may recognize the kilim pillow I made from a rug recently. I got that brass tortoise shell by Nate Berkus (discontinued) at Target. Where else, right? The lamps are the George Kovacs nickel sconces from Lamps Plus. The bird with type on it is from West Elm from way back when. The cabinet was bought in Denmark. The first piece of furniture Frank and I bought together for the house we built then. I got the plant at Lowe's. It's a Kangaroo paw. It's got fuzzy flowers and I love the shape of the branches and the variation in color. This plant requires full sun light, which we are fresh out of in the entry hall, but I hope it will stick around for a while. If it starts looking sad, I will probably put it in the back yard. The vase was a wedding gift. The rug is the Magical thinking costa geo rug from Urban Outfitters. Gotta love that name. I have been standing on it to see if it works. Totally does! I think it feels very welcoming and I am pretty stoked about this color combination as well as the mix of animals: A flamingo, some swans, a letter bird and three deer. That's my kind of zoo. I love it!! 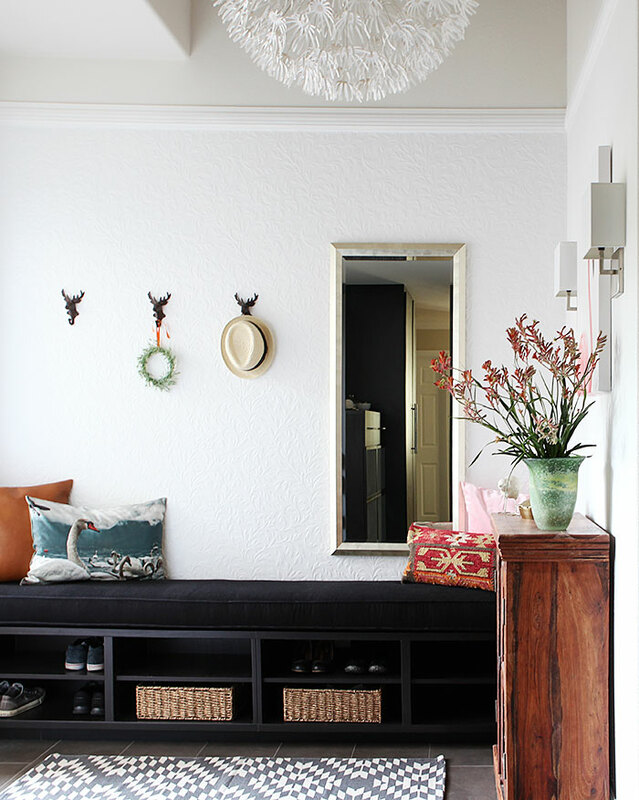 This article: Entry hall - the reveal first appeared on http://ahomefordesign.com.